Background: Immunosenescence is a remodeling of the immune system, caused by aging, with changes in the function of neutrophils, lymphocytes, and Treg cells. Objective: This study aimed to evaluate the expression of molecules CD11b, CD16 and CD64 (neutrophils), CD154 (T lymphocytes), CD40 (B lymphocytes), and to quantitatively analyze the Treg cell subpopulation. Methods: 49 elderlies (≥60 years) and 49 adults (≤35 years) were studied. 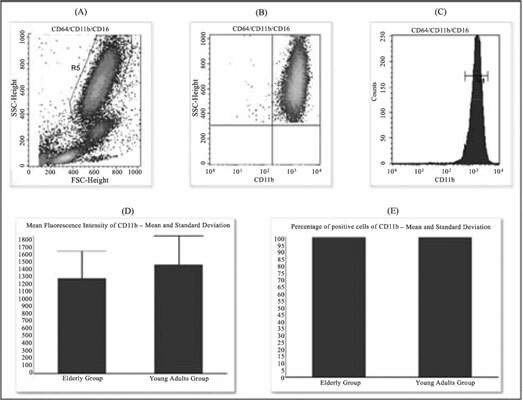 Flow cytometry was used to analyze the expression of surface molecules and the subpopulation of Treg cells, and the results between the groups were compared statistically by the t-test. Results: There was a decreased significance in the expression of CD11b and CD40 in the elderly. Conclusion: Decreased CD11b expression can result in susceptibility to infectious diseases, and impairment of phagocytic capacity. Decreased CD40 expression can result in a decline in B lymphocyte activation. The other molecule studied presented alterations not significant, but compatible with the immunological changes in aging. Keywords: Immunosenescence, aging, neutrophils, lymphocytes, CD11b, CD40. Keywords:Immunosenescence, aging, neutrophils, lymphocytes, CD11b, CD40. Abstract:Background: Immunosenescence is a remodeling of the immune system, caused by aging, with changes in the function of neutrophils, lymphocytes, and Treg cells.